From backyard barbecues to mountaintop races, Fourth of July in Alaska is sure to be a good time no matter where you celebrate. You’ll find a party wherever you go, but here are a couple of our favorites! Set your alarms on July 4 in Anchorage because the pancake breakfast starts at 8 a.m. on the Park Strip and you’re not going to want to miss it. There will be a parade at 11 a.m. and a festival that has it all – music, games, food vendors and more. In true American style, the day will end with the annual Alaska Baseball League doubleheader and a fireworks show. 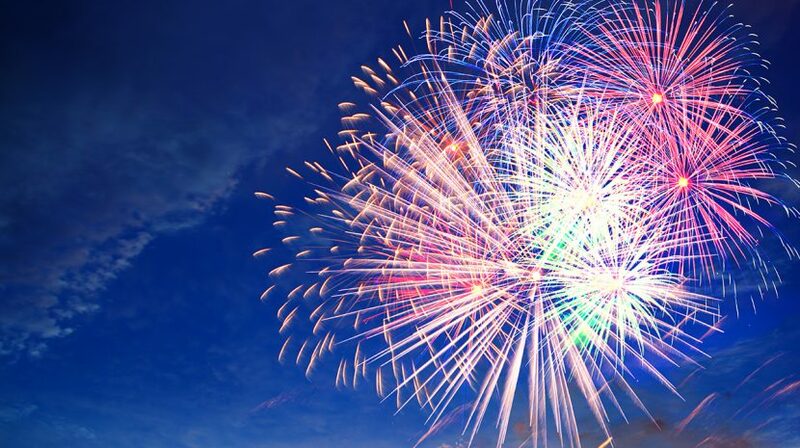 In Juneau, the party kicks off on July 3 with a fireworks display over Gastineau Channel beginning at precisely 11:59 p.m. Afterward, make sure to catch at least a few hours of sleep because the party doesn’t stop on there! On the morning of July 4, festivities begin at 11 a.m. with a parade through the streets of downtown Juneau, followed by all-day fun (and another parade) in Douglas, an island across the channel. Look out for bouncy houses, sandcastle challenges, field events, music, grilling and more! For a town with the motto, “Where the spirit of Christmas lives year-round,” North Pole has one of the most festive Fourth of July parades around. If you head to this community, 14 miles southeast of Fairbanks, you’ll get to experience an Independence Day like no other. A street fair with vendors, games and activities will follow an extravagant parade. And for a northern flair, keep a lookout for a rare appearance from Santa Claus himself as the parade marches down St. Nicholas Drive! If you’re feeling too adventurous to spend your day eating barbecued meats and sipping America-themed drinks in the backyard, then the country’s second oldest footrace, the Mount Marathon Race, is the perfect Fourth of July event for you. This is the largest running event in the entire state and is said to have started as a barroom bet to run from downtown Seward to the top of the mountain and back in less than an hour. Each year the race draws a massive crowd of spectators cheering on racers. It’s been run as an organized race since 1915 and starts at the base of the 3,022-foot Mount Marathon. Runners trek up and speed down the mountain in a mad dash to be the first to make it to the top and back. The race record was set last summer when Alaskan David Norris beat the previous record time, set just the year before, by 20 seconds. He finished in 41 minutes and 26 seconds. Truly designed for the most unshakable of runners, the Mount Marathon Race is never canceled because of weather. Now, go “Fourth” and celebrate our Independence, Alaska-style!